The Healthy Steps Program at Montefiore Health System has been awarded a $70,000 grant from the United Hospital Fund (UHF) as part of a new initiative, Partnerships for Early Childhood Development, to identify social and environmental risks that interfere with children’s healthy development, and connect families with essential services to address those risks. Montefiore will use the award to connect children aged 3 to 5, who are not progressing developmentally as expected, with Preschool Special Education Services – an often difficult process for parents to navigate. Bronx families often lack social support systems, stable and secure housing and access to quality educational opportunities. Preschool Special Education Services connect children in need with dedicated professionals who address the child’s unique educational needs with developmentally-appropriate instruction. However, families often struggle to access these services, and the cycle of poverty, stress and trauma continues, experts say. 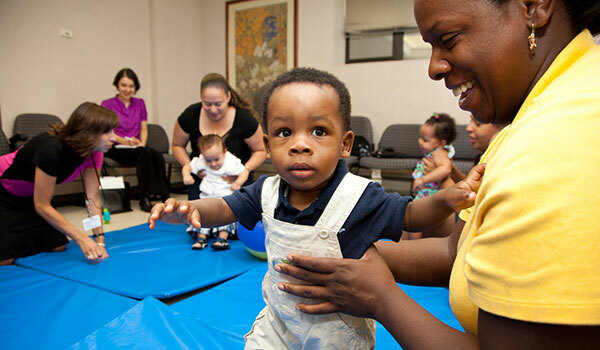 The UHF grant will fund a collaboration between the Healthy Steps Program and the Bronx Early Childhood Direction Center (ECDC) at Bronx Independent Living Services, to develop an efficient referral system where children identified as needing Preschool Special Education Services will be seamlessly connected with them. During this year-long project, children who qualify at two Montefiore pediatric primary care locations, the Comprehensive Family Care Center and The Family Care Center, will be guided by associates from Montefiore and ECDC through the referral process, from evaluation through implementation of services. Two other Montefiore pediatric primary care practices will serve as comparison sites to evaluate the quality and effectiveness of the collaboration. The ultimate goal is to create a sustainable referral process that can be replicated across all pediatric primary care sites at Montefiore. Dr. Briggs is a nationally recognized child psychologist who has built the most comprehensive integrated pediatric behavioral health system in the nation. She brings together a robust team of psychologists, psychiatrists, social workers and child health experts to work hand-in-hand with pediatricians to provide comprehensive behavioral health services in the primary care setting, for more than 90,000 children and their families in the Bronx, through the Healthy Steps Program and the Pediatric Behavioral Health Integration Program (BHIP). Up to 20 percent of children in the U.S. have a mental illness. With behavioral health issues costing the country $247 billion, Dr. Briggs recognized that a creative, proactive solution was necessary to tackle problems such as disruptive and defiant behaviors; anxiety and depressive symptoms; tobacco, alcohol and drug misuse, and aggression and violence, from the very early stages. For more than a decade she has worked to co-locate behavioral health services for children in the pediatric primary care setting, recognizing that it is a safe place for families, and also the ideal environment to provide preventive behavioral health services from birth. The Healthy Steps and BHIP teams screen children at every well-child visit for social and emotional risks, such as parent/child stress and trauma issues, and connects families in need to behavioral health providers in the same practice. Integrating primary care providers and behavioral health specialists in the same building has been shown to increase access to services and improve both mental and medical health outcomes for families. The new funding from UHF will enhance Dr. Briggs’ team efforts to connect children with services that go beyond the primary care setting, to ensure children are accessing all the therapies they need for long-term positive health outcomes.